ADAPT Firearms Glossary, Tactical Terminology,and Definitions. If you have questions or suggestions to add to this page please contact us and let us know. This study guide is used to help our students remember some of the vocabulary that is used during our courses of instruction. Click on any image for an enlarged version. 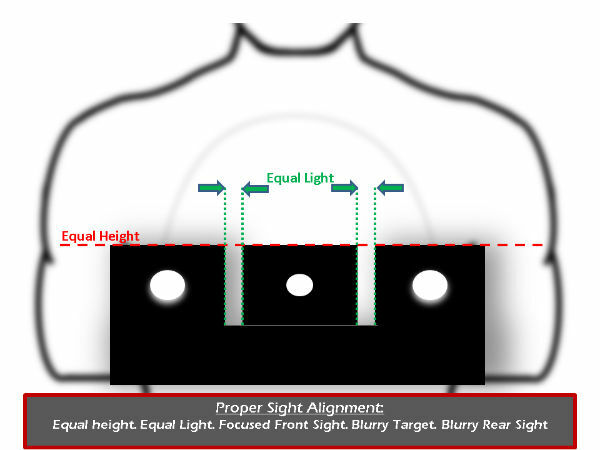 • Sight Alignment - The proper alignment of your front sight in the rear sight notch. (Equal height, Equal light.) See diagram shown below. • Sight Picture - is where you place your properly aligned sights on your intended target. • Trigger Control - is the manipulation of the trigger efficiently in order to not disturb your sight alignment and sight picture. Rule #1 - Treat all weapons with respect and always handle as if they are loaded. The ability of an attacker to do physical harm to you resulting in great bodily harm, serious injury, or death. Administrative Loading - This the process of loading or unloading your firearm in preparation for training, storage, or defensive carry, as opposed to other loading procedures that are performed out of necessity. Balance of Speed and Accuracy - You should only shoot as fast as you can guarantee good hits (a hand-span sized group). This balance of speed and accuracy can depend upon distance, target size, target availability, environmental conditions, and stress. The hand-span is used as it is roughly half the size of the Thoracic Cavity thus accounting for the previously mentioned 50% Rule. Boyd’s OODA Loop - The concept was developed by military strategist and USAF Colonel John Boyd. OODA stands for Observe, Orient, Decide, and Act. (We have overlayed it with our version of Col. Jeff Coopers "Color Code") discussed below. Bump Frisking - Bump frisking is when your body language gives away that you are wearing a gun, such as resting your hand on it, constantly adjusting your garments, or changing the swing of your arms or the gait of your stride. Can be done by another person to acertain if an individual in question reacts as if they are wearing a firearm. ie: Pulls away, protects or guards the firing side of the body. Castle Doctrine - (Castle Law or Defense of Habitation Law) - A law that designates a person’s home (or sometimes car, or anyplace they can legally be - hotel room, etc.) as a place in which the person has certain protections and immunities and may in certain circumstances use force, up to and including deadly force to defend against an intruder without becoming liable to prosecution. As opposed to a Duty to Retreat law. Nevada is a "No Duty to retreat" State. Nevada Revised Statute: NRS 200.120 “Justifiable homicide” defined; no duty to retreat under certain circumstances. (c) Is not actively engaged in conduct in furtherance of criminal activity at the time deadly force is used. 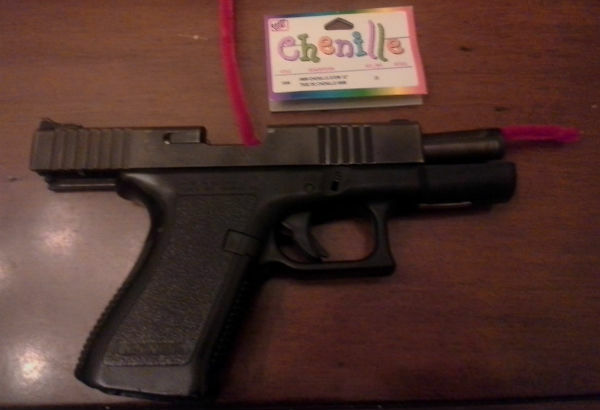 Chamber Check/Magazine Check - a.k.a. (Press Check/Brass Check) An operation performed to ascertain the condition of a firearm; checking to ensure you are aware of whether or not the weapon has a round in the chamber (or chambers on a revolver) and the capacity level of the magazine. 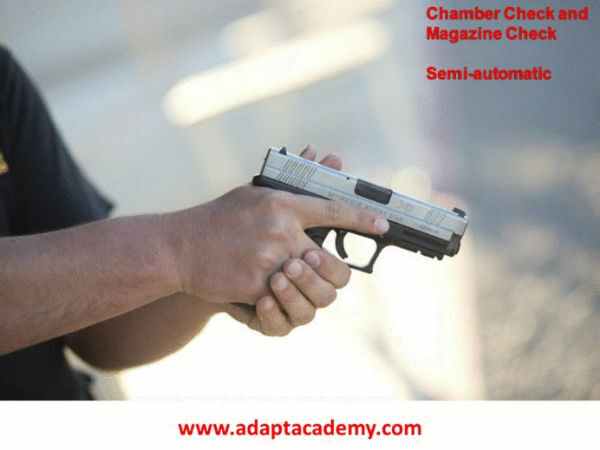 A proper Chamber Check/Magazine Check sequence begins with a visual or tactile check of the chamber(s), removing the magazine and checking that - either loading or unloading, rechecking the chamber(s) and then rechecking the magazine. Click here to view the Chamber Check/Magazine Check animation. Chamber Flag- A piece of material (usually plastic) that is inserted into the ejection port and chamber of a weapon as a visual indicator that the weapon is clear and unloaded. (Used for many weapons where the slide does not lock open, or for ease of inspection when traveling. )Instead of a factory made chamber flag, you can adapt to use materials you have on hand such as para-cord, or perhaps a pipe cleaner. Homemade chamber flag. Tapco Factory Chamber flag. Chamber flag. Close Contact - Close Contact is a firing position utilizing body reference points to enable us to fire upon an adversary that is at extremely close range (arms length or just beyond. )This technique differs slightly from a "Speed Rock" where the body or gun would be tilted up trying to aim the shots into the thoracic cavity of the adversary. This techniques differs from sighted shots where we are trying to get good hits. This technique is using to get what we call "time buying hits" in order to gain distance and follow up with sighted shots if necessary or the threat still exists. 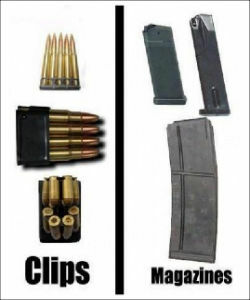 A Clip is a piece of metal that holds the rounds in a set arrangement to assist in loading, commonly found in use with revolvers, some handguns, and rifles, there are no moving parts on a clip. Color Code of Mental Awareness – A description of the level of attention or awareness you may apply to any situation in your daily life. One should always strive to remain in condition Yellow. • White - Un-readiness, internal focus, unaware of your surroundings. • Yellow - Relaxed and aware, a state of general anticipation, where the sudden appearance of a dangerous situation does not catch us off-guard. 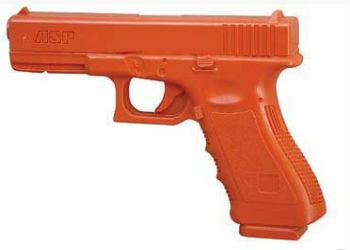 • Orange - Specific Alert, being alert you identify a situation that could indicate a pre-assault indicator. Threat assessment, target identification, and consideration for the rules of engagement begin to take place. • Red - Specific threat, the fight is now imminent. Decision to engage is based on your personal mental trigger, or line in the sand. • Black - Immediate engagement, the fight is already on. (You may not know until you take the first round. Controlled Pair/Double Tap- In a defensive shooting a controlled pair meaning two sighted shots are placed in the COM as the standard response to a threat. This is sometimes referred to as a Double Tap however by contrast the standard Double Tap usually consists of one sighted shot and the secondary shot followed closely behind while not observing the sights. 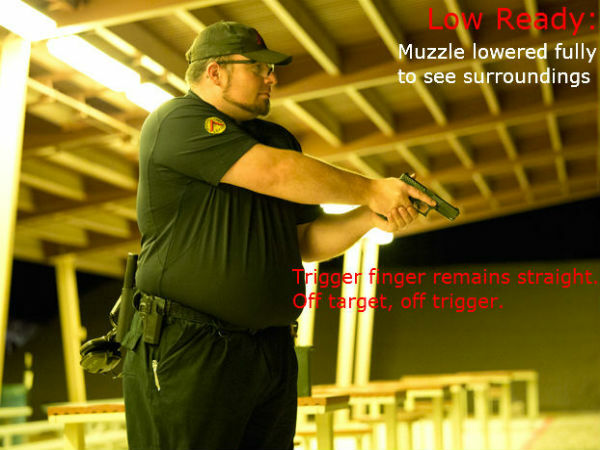 To an experienced shooter who can efficiently manage recoil the second shot should strike relatively close to the first, however for a novice shooter the secondary shot is often fired too fast while the front sight of the weapon is still high due to muzzle flip thus resulting in the second shot going high and possibly off target. COM, Center of (Vital) Mass - We use the term Center of Mass, or COM, to describe the portion of a person’s torso from the top of the rib cage down to the diaphragm. We shoot to the COM because it is a large target area and therefore can be addressed quickly. This area houses a large number of vital organs including the lungs, heart, and major blood vessels. This area is also called the thoracic cavity. A sudden loss of air or blood pressure in the thoracic cavity resulting in a Pneumothorax or Hemothorax can usually results in shock and hopefully stops the threat. 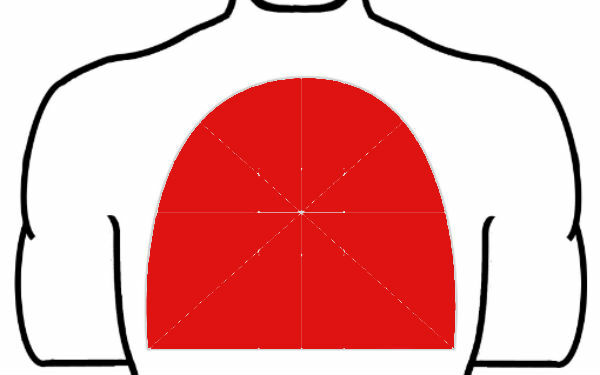 COM: Defined by the "domed" shape area on our target. Cranio-ocular Cavity- This area is defined by the eye sockets and nasal cavity, it is a four inch band that wraps all the way around the head under the skull cap that allows for penetration of a handgun round into the central vital area of the head. Defined by the "box" shape in the head on our target. DA / D.A. - DA is often the shorthand or abbreviation for "Double Action". See: Double Action below. Deadly Force - The amount of force that which when applied will likely result in death or great bodily injury. The three factors that need to be present to justify the use of deadly force in self-defense are: ability, opportunity, and intent. Once those factors exist, we must also judge the situation - asking, is it imminent (happening soon) or immediate (happening now)? Decocker - A decocker is different from an external safety as it does not make the weapon incapable of firing, it simply takes a double action firearm from it's cocked state (single action) back to double action. In this process it returns the hammer to the downward starting position and reinstitutes the standard heavier trigger press. External safety discussed below. Slide mounted decocking lever as found on a Beretta. Frame mounted decocking lever as found on a Sig. 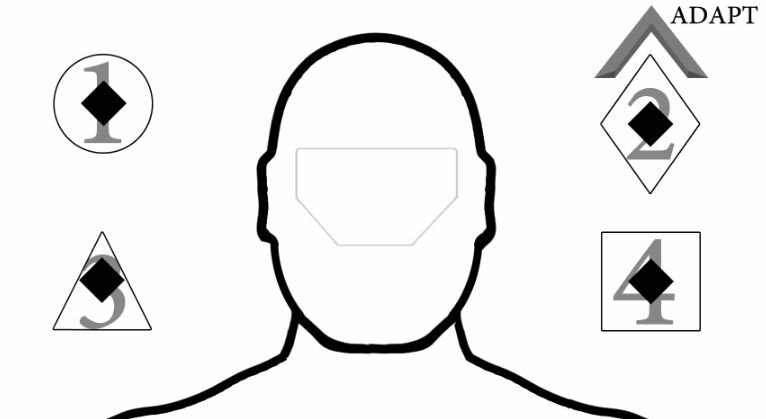 Designated Head Shot - A shot to the cranio-ocular cavity as the primary response because the standard response of a Controlled Pair is not available. Some of the reasons a Controlled pair may not be a viable option would be: The adversary is wearing visible body armor. The COM is obstructed by concealment or cover (perhaps a loved one in a hostage situation). Lastly and perhaps the most simple reasons is, it is the only shot you have. 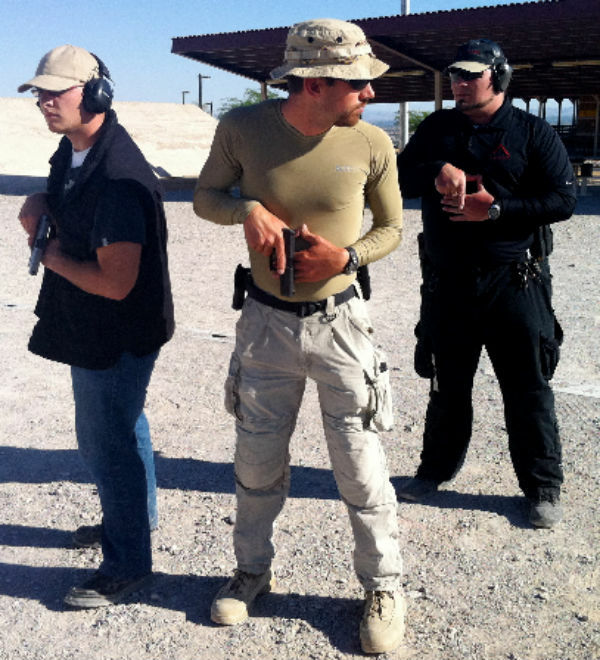 Dry Practice - Dry practice refers to the act of manipulating firearms without the presence of real or live ammunition. Dry practice can be done safely by unloading and checking the weapon. For some manipulations such as Malfunction clearances simulate their causes and utilize "Snap Caps" or "Dummy Rounds". 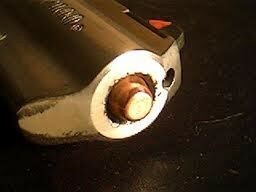 Dry practice can possibly cause damage to a .22 caliber rim-fire weapon if "snap-caps" are not used. Failure to Stop - A threat that is not stopped by firing the standard response of a controlled pair to the COM. Instead, after the controlled pair, we assess the situation and find the threat still exists. In this situation, we follow up with a shot to the cranio-ocular cavity to stop the threat. 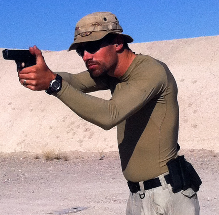 Grip - Hand placement on the stock of a firearm, establishing isometric tension; or the stock itself. 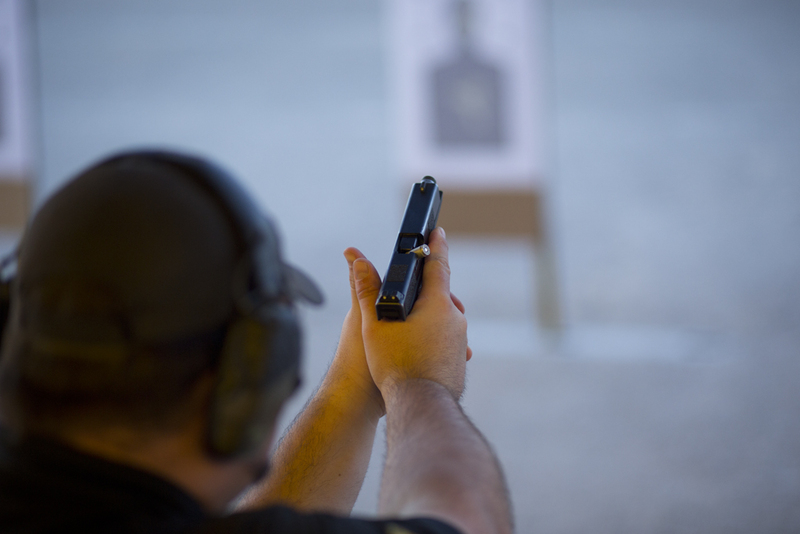 Proper grip of a handgun starts with the web between the thumb and index finger of the firing hand high on the tang of the weapon, fingers on fingers and thumbs on thumbs; trigger finger straight on the reference points unless on sights and on target. 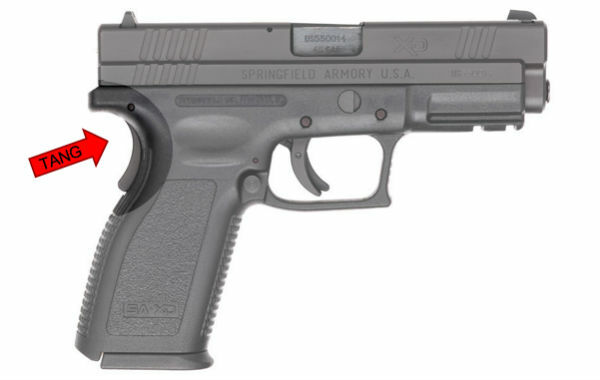 Grips - The side plates of a handgun or additional sleeve added to the stock/frame to add aesthetics or functionality. Possibly to add or decrease sizing for comfort, friction, or accessories such as a grip mounted laser. 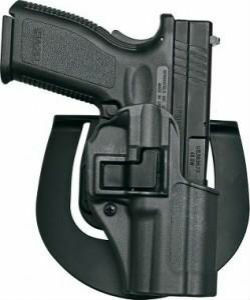 Grip Safety - A safety mechanism, usually a lever built into the back-strap of the pistol grip, that automatically unlocks the trigger mechanism of a firearm as pressure is applied by the shooter's hand. Hangfire - A hangfire is a delay between the press of the trigger causing the firing pin to strike the cartridge primer, and the ignition of the propellent. The delay can be incredibly short or last a few seconds. In most defensive shooting scenarios a hangfire is treated as a Type 1 (a Dead or Dud round) and the cartridge is immediately ejected to continue the firing exercise. However a danger becomes present in large caliber weapons. If a large cartridge is expelled outside of the weapon and detonates with no chamber to guide it's explosive force safely down the barrel, injuries could result. In the event of a hangfire on a large caliber weapon, it is advised to keep the muzzle pointed downrange in a safe direction and let the round "cook off" by waiting 20-30 seconds before expelling the round from the chamber. -- In combat or in the field a hangfire should be ejected as clearing a malfunction, as the shooter moves, if the round detonates the shooter having gained distance from the detonation decreases their chances of being harmed, and being without a weapon for an extended period of time. 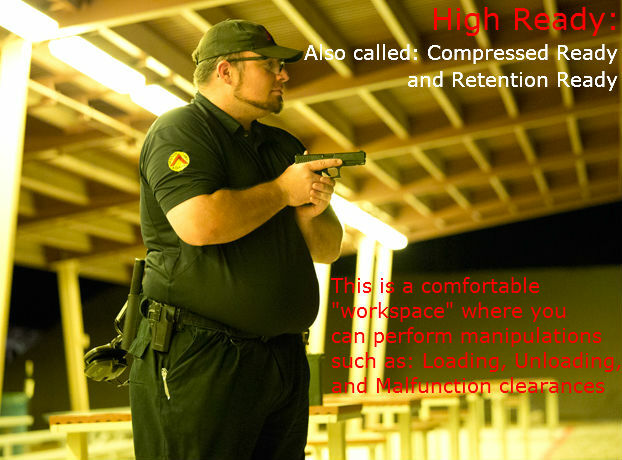 High Ready - The High Ready is another name for the Compressed or Retention Ready. 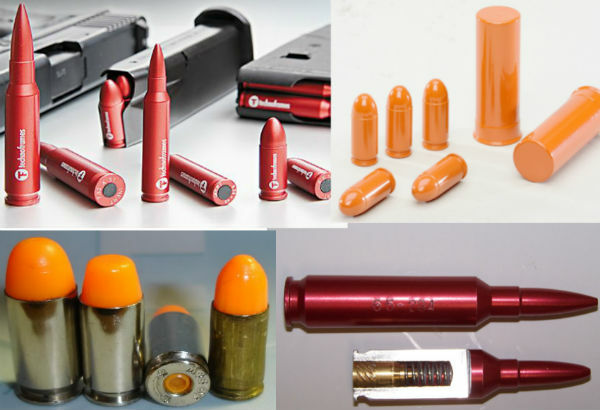 Hollow Point Ammo - Hollow point ammunition is the preferred ammunition used as Self Defense ammunition. This type of ammunition is designed to mushroom or expand to deliver more energy to the target and reduce the risk of over penetration. Holster - (n.)A holder used for carrying a firearm. (v.) Holster or Holstering: The act of placing your firearm in its holder. Visit our page on Recommended and Approved Holsters. Isometric Tension - A balance achieved through a forward push with the firing hand and a rearward pull with the support hand, essentially putting your weapon in a hand vice, which will help manage the forces of both muzzle flip and recoil. Isosceles Stance - This position is based on the body’s natural response to an unexpected threat - the untrained body will automatically react by crouching and pushing away from the threat. The body is squared off towards the target, assuming an aggressive athletic stance: weight on the balls of our feet and shoulders forward. 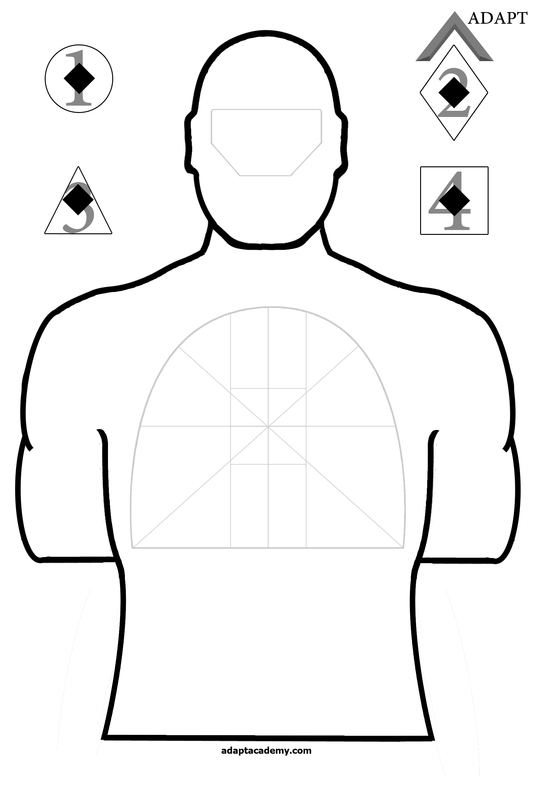 Arms are extended towards the target so that the torso and two arms create an isosceles triangle. 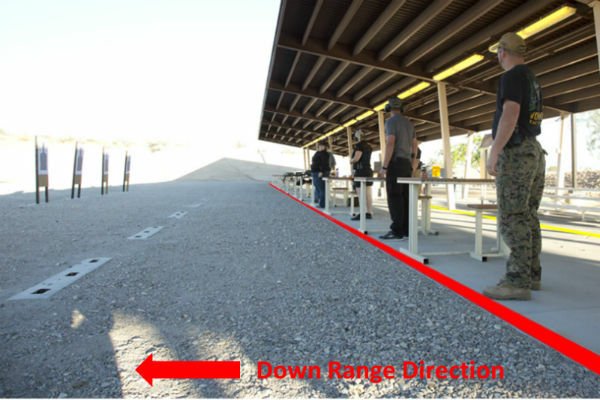 Low Ready - The Low Ready is a position of readiness where the weapon is depressed towards the ground at about a 45 degree angle, which allows us to still maintain full view of the environment keeping our field of vision clear of obstructions. 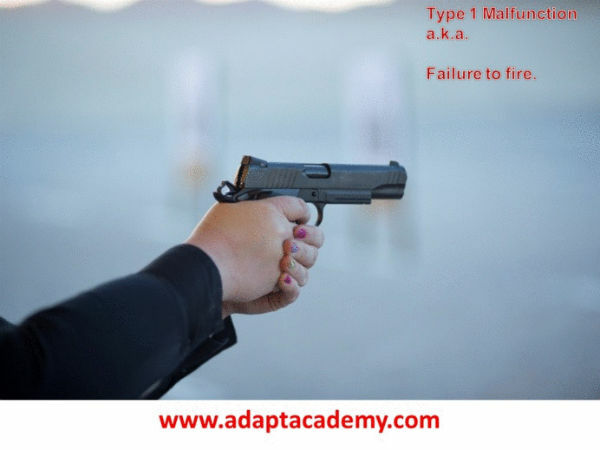 Malfunction - One of the three reasons a gun can stop firing. Different than a jam, a malfunction is a temporary problem that can be assessed and fixed fairly quickly to get the gun back in the fight. Type 1, or Failure To Fire. Sign and Signal: Click, no bang. Solution: Tap, Rack, Flip. Re-assess the situation and determine if follow up shots are necessary. Click to view Type 1 Malfunction clearance animation. Type 2, or Brass High, Failure to Eject, "Stovepipe". Sign: A dead or inactive trigger. Signal: While moving you look at the ejection port to assess and note there is Brass trapped high in the ejection port. "Stovepipe"
Click to view Type 2 Malfunction clearance animation. Click here to view and download the Type 2 clearance clip. 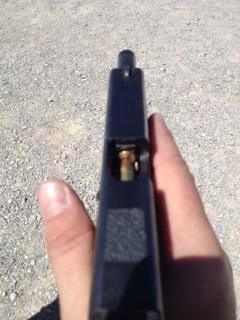 Signal: While moving you look at the ejection port to assess and note there is Brass trapped low in the ejection port, or a double feed in the chamber. Solution: Move, Identify, Clear (Lock slide, strip magazine out, rack, rack, rack, insert magazine, rack)Reload and Re-assess the situation and determine if follow up shots are necessary. Click here to view the Type 3 Setup animation. Click here to veiw and download the Type 3 clearance clip. 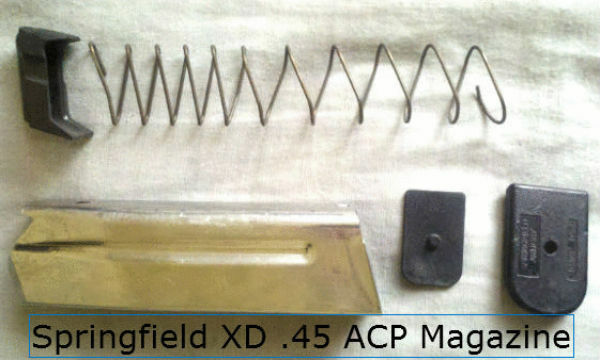 The individual parts of most magazines are: body, spring, follower, base plate, and possibly a retention clip. Muzzle - The opening at the end of the barrel of the firearm where the projectile leaves once fired. Muzzle Flip/Muzzle Rise - The upward rotation caused by recoil that occurs when a weapon is fired. Muzzling - A firearm safely violation, whereby the armed individual is inadvertently pointing the muzzle of a firearm at someone/something that they do not intend to destroy. Also known as "flagging","sweeping", or "covering" another. Negligent Discharge - The unintentional firing of a weapon caused by the carelessness and or lack of training/discipline of the shooter. 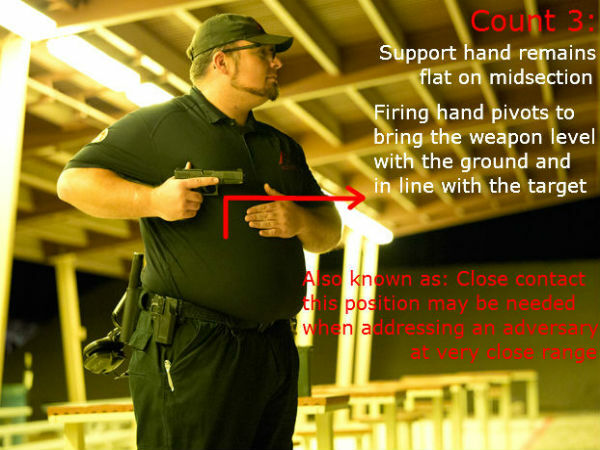 Presentation from the holster / Draw Stroke - A five count process by which the weapon is safely and efficiently presented from the holster to the target or a ready position. This is also sometimes referred to as the "draw stroke" or drawing the weapon. Presentation cycle animation. Re-holstering cycle animation. Count 3: The firing hand rotates or pivots the weapon to where the muzzle is pointed downrange and the weapon is level with the ground and in line with the target. (Also called "Close Contact". See Close Contact above.) In this position safeties can be disengaged. Count 4: The support hand and firing hand begin to move towards one another sliding along the body until the hands touch and we begin to form a two handed grip and the weapon moves towards the target. Count 5: Is also called "Pointed in" we are on target, on sights, and on trigger ready to fire. Keeping the weapon level with the ground as we raise the sights to the level of our eyes and extending to the full presentation. Printing - When the outline of your weapon shows through a concealment garment. Wearing an appropriately fitting garment, a dark color or busy pattern also helps to break up this profile. Quick Check - Performed during the Survival sequence to ensure that there are no additional adversaries in your immediate area. Recoil - The rearward push that occurs by the force of the projectile leaving the barrel when the weapon is fired. This also often results in muzzle flip/rise. Retention Ready - This position is also known as "High Ready", "Compressed Ready", or simply "your workspace." This position allows us great control and dexterity when manipulating the weapon during administrative loading and unloading, tactical and emergency reloads, malfunction clearances, or weapons retention in close quarters movement while searching. 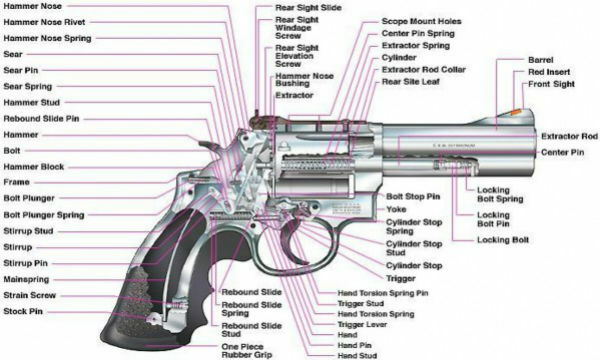 Revolver - A handgun with revolving chambers that, when the trigger is pulled, or the hammer is cocked back the cylinder rotates and aligns the chamber with the barrel. When the trigger is pressed completely to the rear the hammer falls and strikes the firing pin, firing the weapon. 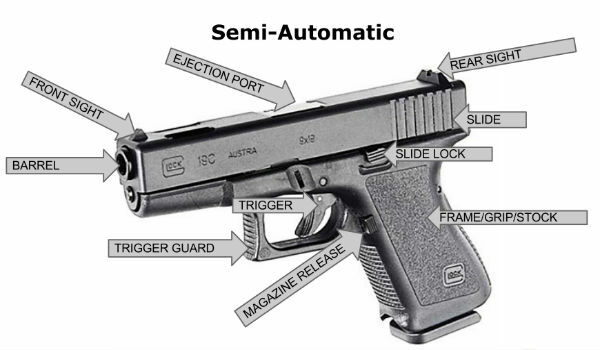 Semi-automatic - One round is fired with each trigger press. 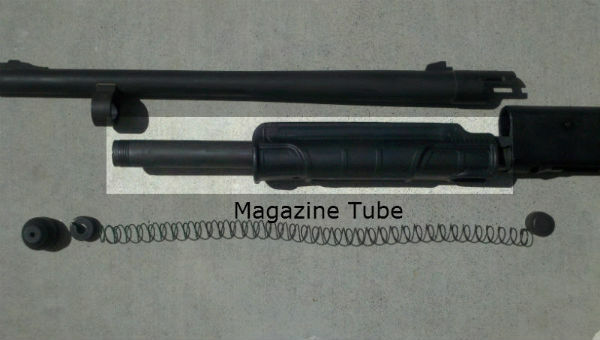 When the the weapon is loaded and fired the slide cycles back ejecting the spent casing, the magazine lifts a new round into position and as the slide returns forward it chambers a new round in preparation to fire again. Sights - Devices used for aiming a firearm. 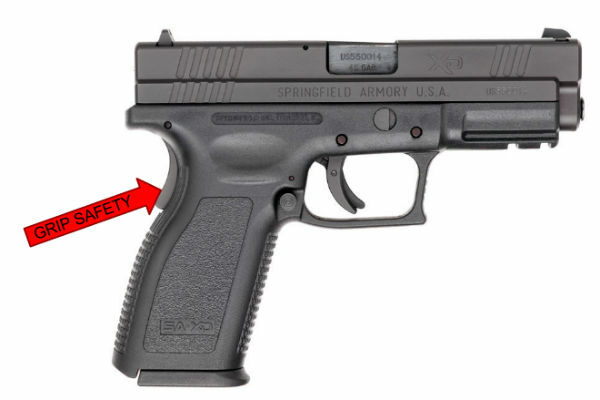 Most handguns have a front sight post and a rear sight notch that must be aligned. See either: Semi-Automatic diagram above or Sight Alignment picture here. Sight Alignment - Is the proper alignment of the weapons sights in relation to the shooters eye and the target. Most weapons sights are considered to be aligned when the front sight post is centered in the rear sight notch. Referred to as equal height (the level line formed by the top edge of the front sight post and the tops of the rear sight) and equal light (the ambient light showing on the sides of the front post between the rear notch). 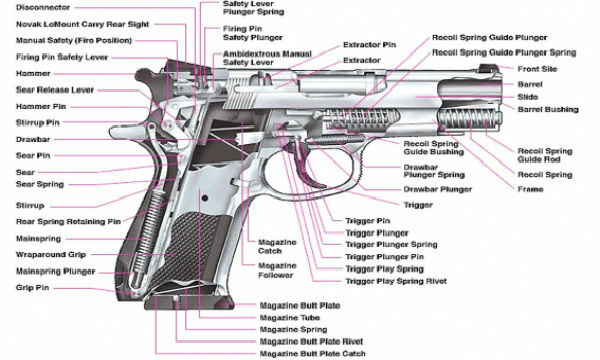 Slide - The part of the weapon on a majority of semi-automatic pistols that moves during the operating cycle and generally houses the firing pin or striker and the extractor, and serves as the bolt. It is spring-loaded so that once it has moved to its rearmost position in the firing cycle, spring tension brings it back to the starting position chambering a fresh cartridge during the motion provided that the magazine is not empty. See also:Semi-automatic Diagram above. Slide Bite - A common injury caused by improper grip/thumb placement on a semi-automatic weapon. The web of a shooters hand or thumb is cut or abraded by the rearward motion of the slide. 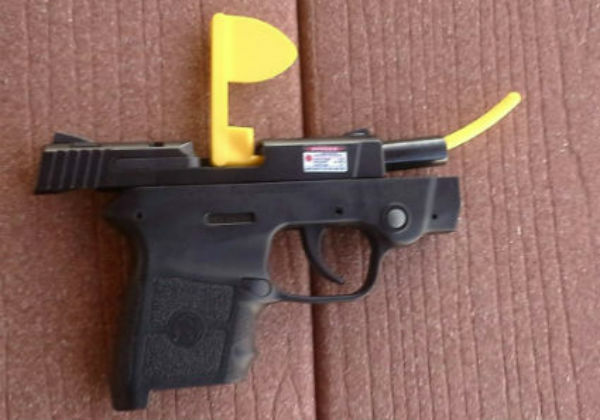 Slide Lock/Slide Release - The part of the weapon that when actuated allows for the slide of the weapon to be locked open for access to the ejection port or while performing administrative functions, when moved in the opposing direction it generally performs the opposite function and allows the slide to return forward thereby closing the ejection port. Snap Caps/Dummy rounds - Non firing cartridges. 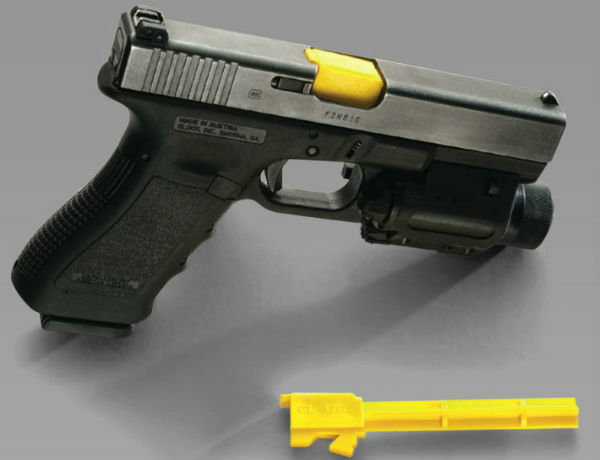 Some have the addition of spring-loaded "primers" used to test the mechanical functioning of a firearm or for dry practice. 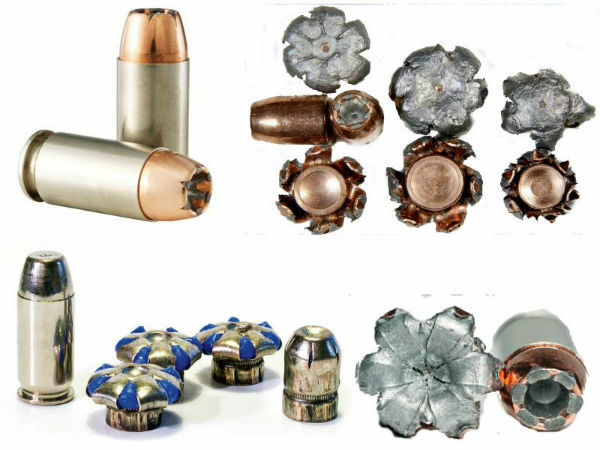 Some examples of snap caps/dummy rounds available for most modern firearms. Speed Reload - Topping your weapon off by dropping or stripping a partially depleted magazine from the weapon to the ground and inserting a full one from the pocket or belt pouch. Squib Load - A jam. Often referred to or observed as a “pop” instead of a “bang”. When the primer fires but fails to ignite the powder, or there is insufficient powder in the cartridge, resulting in an underpowered explosion where the projectile fails to leave the barrel. If you fire another round immediately behind the lodged round you run the risk of blowing up your weapon. Your best course of action in a gunfight is to transition to another weapon system, or immediately cease shooting and have the weapon repaired. An example of a squib load not having enough power to make it out of the barrel. Sul - Meaning “South” in Portuguese, it comes from classical sword fighting terminology, when the weapon is pointed downward. In the Sul position the support hand is flat against the midsection of the body parallel to the ground. The weapon in the firing hand is stacked on top of the support hand in such a way that the barrel or muzzle is in line with the knuckles of the support hand and perpendicular at a 90 degree angle to the ground. Properly done the muzzle should point a few inches in front of the toes directly between the legs. Support Side - The side of the body opposite to the firearm. Survival Sequence - The sequence of motions we practice to train our bodies to continue the fight until the end while maintaining situational awareness. Failure to perform some sort of survival sequence can result in death. FINISH THE FIGHT!!! Tactics - We here at ADAPT like to define "tactics" with the following statement "The ability to observe, reason, and decide to move or act in a manner that decreases the likelihood of sustaining injury to yourself or others while maximizing the degree of success in defeating threats and surviving the encounter. To sum up, tactics is the art of staying alive." Techniques are skill sets, Training is purposeful repetitions to acquire ability, Tactics are knowing when and which technique to use. Tactical Reload - Performed after you have determined there are no immediate threats, it involves a chamber check to ensure your weapon is loaded and functional, checking to see if you have more ammunition, retaining any remaining ammunition in your weapon, and topping your weapon off; this helps your motor skills and gives your hands something to do which helps to prevent the onset of shock. Tang - The curved portion of the frame that may extend beyond the frame under the slide often used to protect the shooters hand from slide bites, and used to join the receiver to the stock on shotguns and rifles. 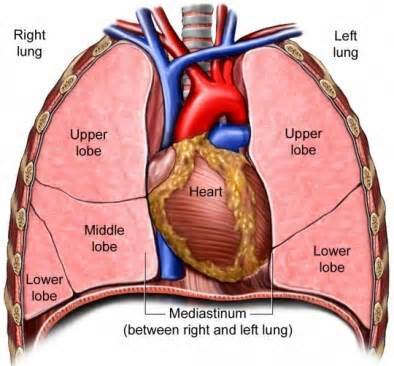 Thoracic Cavity - Describes the portion of a person’s torso from the top of the rib cage down to the diaphragm. We shoot to the COM because it is a large target area and therefore can be addressed quickly. This area houses a large number of vital organs including the lungs, heart, and major blood vessels. This area is also called the COM. A sudden loss of air or blood pressure here usually results in shock and hopefully stops the threat. Training Barrel A Training barel is an injection molded piece of plastic that can be inserted into a semi-automatic firearm so that a real weapon can be used in scenario training. The training barrel does not allow for any ammunition to be chambered thereby eliminating the chance that a live round could be introduced into a force-on-force training scenario. Trigger Control - Trigger control is the manipulation of the trigger efficiently in order to not disturb your sight alignment, and sight picture, thereby increasing your accuracy. Mentioned in the 3 Secrets of Marksmanship above. Smooth press to a surprise break (A smooth albeit rapid movement of the trigger straight back, allowing the weapon to fire, rather than jerking the trigger and "making" the weapon fire. 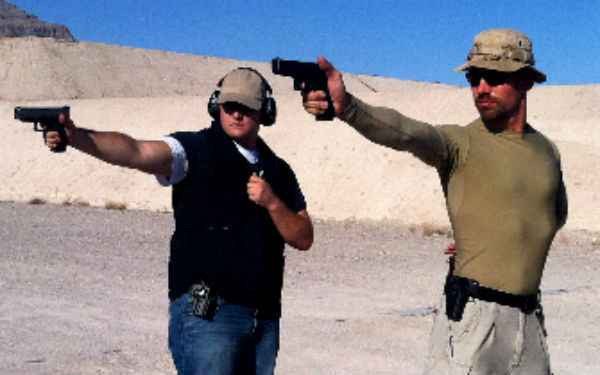 Tueller Drill - The "Tueller Drill" was a name coined in an article by Massad Ayoob of an exercise conducted by a Salt Lake City Police Officer named Dennis Tueller. In 1983 a question was asked in a class "How close is too close to allow an attacker armed with a contact weapon (pipe, knife, bat, etc...) and how far is too far to justify a shoot? This was known as "The shooter's dilemma" at the time. Officer Tueller devised an action and reaction exercise to discover how much distance an attacker could cover and the time it takes for an Officer to respond with fire. The results were generally referred to as the "21 foot rule" as that was the average distance that the attacker could cover before the responding individual could fire. 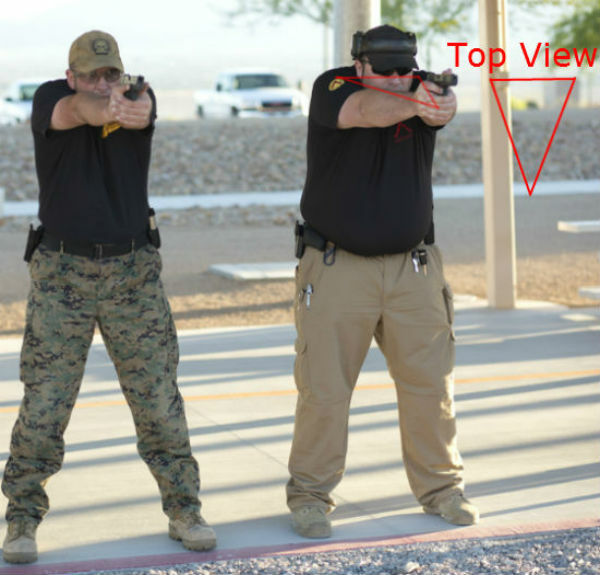 Note: Recent policy changes in Law Enforcement agencies have increased this distance from 21 feet to 30 or 35 feet to allow for the Officers delayed reaction time, or presentation from a retention holster. Weaver Stance - This stance was created by Southern California Deputy Sheriff Jack Weaver in the late 1950's. A bladed body position stance most commonly used by athletes and fighters. The firing side hand pushes the firearm forward, and the support hand pulls rearward developing isometric tension to help reduce the effects of muzzle flip and recoil. Additional reference you can research "Modern Technique of the Pistol" developed by Jeff Cooper.